If you are not aware of it, then I should warn you — we are kind of in a period where zombie fervor has some what taken over American pop culture. We’ve been in this period for awhile now, over a decade in fact, tracing back to movies like Danny Boyle’s 28 Days Later… (2002), Zack Snyder’s Dawn of the Dead (2004), and Edgar Wright’s Shaun of the Dead (2004). There have been good entries, and there have been bad entries; there have been those that treat the “zombie apocalypse” as serious and realistic and those that lampoon our seeming obsession with and belief in the possibility of zombies (prompting even the federal government via the Center for Disease Control and Prevention to get in on it). And, since Hollywood is the preeminent source of storytelling and entertainment-based industry in the world, other countries and cultures have responded to this American obsession. A basic zombie movie is one of the most commonly made horror movies because it can be so cheap to make and yet still look well-done. And since the creatures less of a concrete cultural and historical starting point as compared to other monsters, they can be more flexibly adapted into different contexts. At the base of the zombie obsession is the fear that the people around you could become mindless killers almost instantaneously. Given our increased urbanized lives in the 20th and now 21st centuries, everyday we are surrounded by people we just do not know who could have such a monster lurking inside. The media’s stories of violent individuals “disturbing the peace” only helps to fuel our perceptions of this possibility. Even the people we think we know become suspect with stories of domestic abuse and violent stalking. Anyone could become a monster at a moment’s notice. Which actually makes the zombie a monster akin to the individuals who suffer demonic possession. With demonic possession, any individual, pious or not, could become the host of an evil spirit. No one is safe, and, indeed, it seems that the innocent are more likely to become possessed — the corruption of a pure soul makes the demon stronger. With the innocent being a child or a young woman, the corruption becomes more intense — the juxtapositioning of such evil in something considered to be so pure makes us much more fearful that anyone could become a monster. The scariest zombies are those who come from loved ones, from children, from the pure. The zombie and the demon touch upon similar fears we have about those around us, those that we love. So it makes sense then that the two monsters would eventually come together in one horror movie franchise. 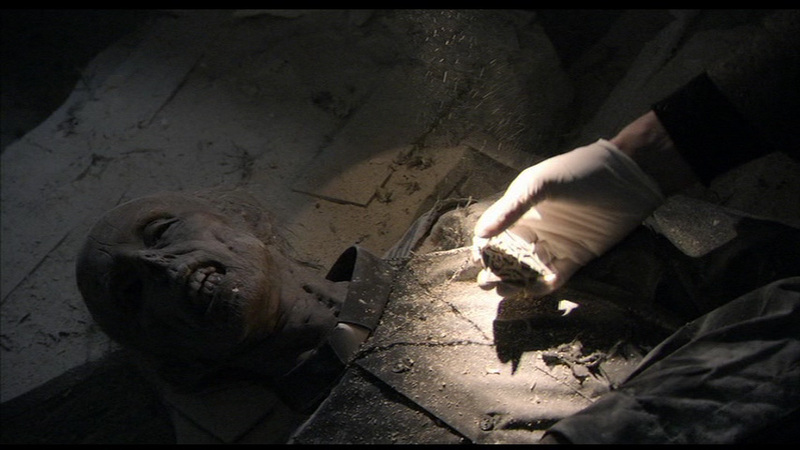 In 2007, Spanish found footage movie [REC] made enough of an impact in the horror subculture that it was quickly remade in 2008 as found footage movie Quarantine. Both are good movies, and both depict essentially the same sequence of events: a news team is doing a story with a fire department crew when that crew is called out to an emergency in an apartment building; the emergency turns out to be an infection that is causing all of the residents to essentially become the runner zombies of 28 Days Later fame. Both movies end with the surviving member of the news team — of the “last girl” trope — being dragged away into the dark by an unseen monster. Interestingly, the sequel to the original movie really delves into the reason behind the infection. Rather than have it be some form of rabies, as was initially proposed by the first film, and focused on in the American remake, the sequel expands upon the discoveries of the first film about the presence of a priest conducting experiments in the penthouse of the apartment building. In the sequel, we learn more about the Catholic Church’s role in the infection, and while it doesn’t always make sense, the film clearly blamed the zombie apocalypse sweeping Spain on the emergence of a viral form of demonic possession. This convergence of different monster genres makes [REC]2 (2009) an interesting addition to this project, as it bridges different horror subgenres while simultaneously showing the similarities in what scares us about these monsters. What follows then are our observations from viewing this found footage sequel. So this film picks up right where the first one left off. We were being led to believe in the first one that it could be a viral outbreak causing the problem — although I do remember some religious iconography in that scientist’s office. 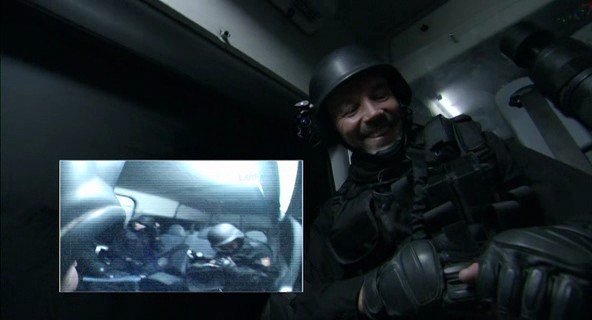 And once more we venture into found footage, where the cops going in are saying that they need to record everything. Weird, though, to have a brief title credit sequence. You do not really see a lot of title credits in a found footage movie. It is weird, since it completely disrupts the idea of the footage being real and not produced. Again the officials are saying it is an infection, as in viral or bacterial or in some way scientific. So something like rabies perhaps? I wonder how much memory their camera has to waste it on recording the van ride to the scene. This cop’s helmet cam is really nice high res — which is ironic, given that this is found footage, which is not known for producing high quality visuals. Again the disconnect between format and style. A scientist who doesn’t want to say anything. That is a common trope, to make the scientist a jerk, someone who cannot be trusted, to undermine science. Yes, definitely religious iconography in the room. Images, photographs, symbols, and a discussion of Rome being worried. Film seems to be setting up the tension between science and religion so common in exorcism cinema and horror in general. Interesting how the cops seem fearless because they have their guns and gadgets; definitely phallic symbolism, where men feel powerful because of the phallic objects that give them such power. Ooh, picture in picture — that I have not seen before with found footage films. It makes the movie feel like a first-person shooter game. Like Resident Evil in FPS, which in a way connects this film to another zombie media product. The infection spreads quickly it seems. Okay, so the scientist starts saying a prayer over the cop who is infected, beseeching the Lord’s spirit to guide him, and the infected guy stopped to stare at him. They lock him in a room and nail a rosary to the door. So apparently the scientist knows about the demon aspect? Is he even a real scientist? In fact, what the guy says to the infected cop sounds like it could be part of an exorcism ritual. Okay, so this is the back story according to the exposition of the film: a young girl at age 11 started to show signs of being possessed and the Vatican investigated. They sent this Father Albelda, who had rented the penthouse, to investigate and to study the physiological symptoms of the possession. They were trying to isolate the chemical essence of the demon to create an antidote. Thus they were using science to treat demonic possession. So that is an interesting way to tie religion into science. But using science to address the possession caused the virus. Because the infection is the demon spreading like a virus, science is to blame. If they were not using science to address the possession, then the demon would not have become a virus. It is revealed that the scientist, Dr. Owen, is really a priest. On a secret mission from the Vatican, apparently, to learn what happened to Father Albelda. Having the possessed people be attacking others so violently and so quickly makes the possession very different from other examples we have seen. This is where the zombie genre influence comes in. But that is not the other difference, because the scientific angle would suggest that exorcism is not necessary if an antidote or medical cure can be found. According to Dr. Owen, the blood of the originally possessed girl is supposed to help them find an antidote to the infection. The tradition and superstition of exorcism gives way to medical science. Experimenting with children? A reflection of the perception of the Catholic Church after the child abuse scandal? One of the possessed is crawling on ceilings, just like in Exorcist III! And a young child who is possessed – boy or girl though? The child is so emaciated and dirty it is hard to tell. They find Albelda as a mummy. With some weird pendant. Dr. Owen is one bad dude, shooting a child in the head like that. And it really does feel like a video game with this first-person POV style. Three more possessed kids in the ducts. Still uncertain of gender. But definitely seeing them only as possessed, no innocence at all. Dr. Owen pours out the blood from the girl who was originally possessed; he prays over it, lays cross over it — it reacts negatively, goes up in flames. And destroys all of the blood. So, no antidote them? Out in the stairwell, where did all these people come from? And even with a demonic possession, the order is to shoot in the head to kill, just like with zombies. No attempt to collect the people and perform an actual exorcism over them. Since the cure is gone, but they know it is demonic possession, why not try to help these people? Is it because the exorcism will not work, because science messed things up and turned the demon’s essence into a virus? Almost like this movie focuses on the reason religion and science cannot mix — you end up with a demonic possession that can be spread like a viral infection that cannot be stopped with traditional methods. Again, science is too blame. Another possessed child, clearly a girl, she says she knows the priest. Dr. Owen tries to force her to say her name. Priest seeks to know where the demon, in the original girl, is hiding. If they can find the original girl, the one whose possession started this all, then perhaps they can still make the antidote. Again, too late for an exorcism because it is an infection? So…now we shift cameras to the other group in the building, the young adults the cops saw in the stairwell. We see their experience from the beginning, effectively going back to the beginning of the movie, and seeing the cops from their perspective. More teenagers than young adults, and the girl is definitely the one who doesn’t want to do the risky things the boys want to do. And they keep making fun of her for being the scared yet sensible one. We follow them getting inside, through the sewers, finding some things from the first movie. And yet, for some reason, they keep going inside, perhaps thinking that they could record what is really happening and make money off of it. Then they hear crying. Ooh, could that be the demon tricking them, luring them in, by pretending to be a scared girl? Yes, it is, because they find the door with the rosary holding back the infected cop. That was a classic bit of demonic possession. Staying with the teenagers, until the cops find them. Thank God. I do not know if I could handle just being with these whining kids. Tito gets infected, and Dr. Owen realizes they can use him once he is fully possessed. The priest has orders to get proof about the possession. Okay, praying over Tito, and the demon responds very calmly. Not truly an exorcism, but shares similarity in the prayers and the purpose of the rites. Priest demands to know where the demon is. Demon says everywhere. Priest wants to know about the original girl, but the demon taunts the priest, saying the priest is not smart. Sexual taunting from the demon. Says priest is afraid. The possessed speaks in riddles. Priest says the fallen angels were kept in prisons of darkness where no light reflects, so they need the night vision on the camera to see where the original girl is. Exactly like a video game — gotta use your night vision upgrade to see the enemies. Night vision reveals a door in the dead end hall. Three of the group go blindly into the dark — the priest, a cop, and the reporter — a leap of faith perhaps? Okay, that is kinda clever, with the well only visible through night vision, and the possessed girl taking the cop away, and then only visible in night vision. Definitely that melding of science and religion again. The idea that a scientific advancement like night vision allows for the mystical nature of the well and the possessed girl to be revealed. Still saying he needs the blood — again, no real exorcism. So the original girl is dead, but why can’t priest get her blood? Because the demon left after she died? Ah, that is why. Obviously Ángela is possessed. So she tortures and kills trying to get the priest to let her out. And we get that deep masculine demonic voice from her in a laugh and in her talking to him, taking his voice for the voice recognition to be let out. Apparently she got infected when the original girl basically sent a big worm like thing down her throat. Very sexual, very phallic. 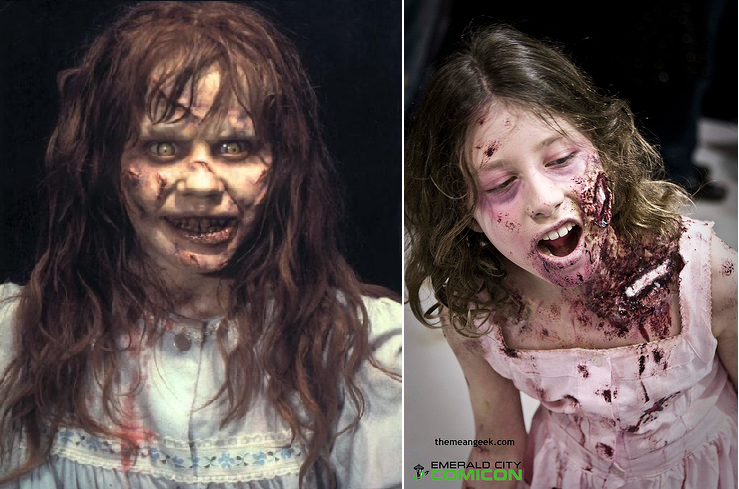 So no formal exorcism ritual, but there are examples of attempts at exorcism, such as trying to force the infected people to reveal the location of the original girl. (From Chris Olson) So while there is no explicit exorcism stuff, I think the film still fits, because there is one sequence that sort of qualifies. More importantly, I think the whole attempt to get the blood (SANGRE! SANGRE!) could be considered an exorcism in itself, because of how the film sort of positions the possession in scientific terms (calling it an infection, dealing with it as a biohazard, etc). There are parallels to The Conjuring, in the idea of possession being transmitted through the mouth. There are parallels to Exorcist III, with the idea of the possessed person being able to exert influence over others do to his/her work — just here it was an infection created by scientifically experimenting with the demon’s chemical essence. And the whole worm thing to pass on the possession indicates that the demon had not just a chemical essence but also a biological one. Finally, there are parallels to The Last Exorcism Part 2, as the possessed girl is able to venture forth into the world, supposedly to spread her evil ways. We have moved from the people being simply zombies to them being akin to zombies but only because they have become possessed by some demonic virus. And again the scariest monsters are those that are childlike, those that are supposedly innocent and who should not possess neither such strength nor ferocity. Also, while it was the Vatican trying to fix things by sending in Dr. Owen to create the antidote, it was also the Church that created the problem by trying to use scientific methods to produce a more modern approach to dealing with demonic possession. So, in a way, both religion and science are to blame for the zombie apocalypse. Next What Makes For a Good Online Community?